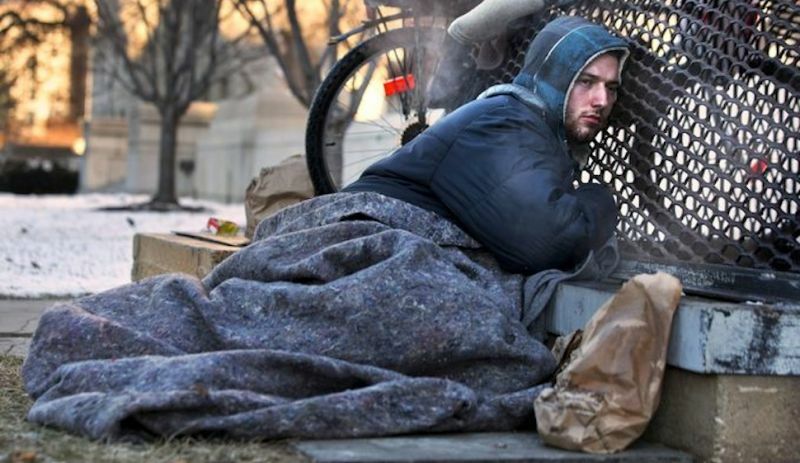 The family of a New York man who went missing on New Year's Day accidentally found him living on the streets in DC in a USA Today weather photo spread. Twenty-year-old Nicholas Simmons was last seen leaving his home in Greece — a town in Rochester, New York — at 5 pm on Wednesday. His concerned family started a Facebook page, which has since been deleted, asking for help. But there were no leads. Nick warms himself on a steam grate with three other homeless men by the Federal Trade Commission, just blocks from the Capitol, during frigid temperatures in Washington, Saturday, Jan. 4, 2014. According to the special instructions on the photo on the AP website, "Nick declined to provide his last name." Simmons' mother reached out to the USA Today reporter, who put her in touch with Martin. @ndiblasio Thank you for contacting me I am in touch with the family now. The family also contacted DC police, who found Simmons in the area where the photo was taken, and transported him to GW Hospital. Before Michelle Hannah Simmons, Nick's mother, deleted the Facebook page, she wrote an update on her son's condition. "Nick is alive but obviously not well..we are going to get him home and safe and this is by far the greatest example of God's love and divine intervention I have ever experienced. I am relieved but still distraught by everything but HE IS ALIVE and his family will get him home, loved and cared for..and healthy again. I am beyond able to put into words how I am feeling . According to NBC 10 News, Simmons left home after an exchange with his parents, leaving his wallet and cell phone behind. A Greece police department captain said that Simmons' father is in DC at the hospital with him. "As this point we really don't know that much about how he got there or how long he has been there. We are fairly certain he drove there, but why he was living on the streets in D.C., we can't tell you at this point," Captain Patrick Phelan told NBC 10 News.